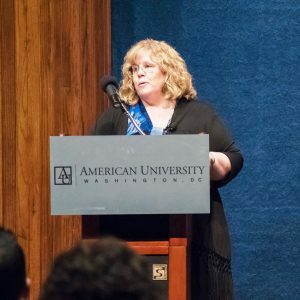 We are excited to have Dr. Laura Owen, our friend and the Director of the Center for Postsecondary Readiness and Success at American University, guest blog for us on the important role of mentors and how mentorship can play a significant role in the success of low-income, first-generation students. She also shares helpful resources for students looking for a mentor and lends her expertise in the below questions. Tell me about yourself and your experience(s) supporting mentorship? Mentors play an important role because students need a number of “significant others” who believe and encourage them as they navigate life experiences. I am a mom to three wonderful children who have had amazing mentors in their life. Sometimes their mentors reinforced what I was teaching and other times they provided a different lens and worldview with a new set of ideas and suggestions to consider. Professionally, I have been a school counselor, district counseling supervisor, a university professor, and now the Director of the new Center for Postsecondary Readiness and Success (CPRS) at American University. A mentor is “an experienced and trusted advisor,” a definition that embodies the essence of a school counselor’s role. I have been privileged to have dynamic and powerful mentors throughout my life. They were my confidants and often helped me balance logic and feeling so I could make informed and balanced decisions. Why is mentorship important to student success? There are so many touch points along a student’s journey where mentorship can play a significant role. It’s cliché to say, “it takes a village,” but in reality it does. Our educational system perpetuates the uneven distribution of resources and inequitable access to high quality counseling and advising support. As a result, we have too many students who are eligible and prepared to attend four-year institutions or enroll in apprenticeship or internship opportunities, but do not enroll because they lack the guidance needed to steer them through the postsecondary decision making process. How can quality mentorship help at-risk students, first-gen and low-income students? I am well acquainted with the challenges and obstacles faced by first-generation and low-income students to not only get to college, but also persist through graduation. Assisting students as they navigate postsecondary opportunities is especially important for first generation and low income students. Research confirms that mentoring and counseling makes a significant difference for these students, but we need to better understand what constitutes “high quality” mentorship, counseling, and advising? Seemingly, there are new groups popping up around the country every day to support students on their postsecondary path, and we need to ensure that the professionals and para-professionals have the knowledge and skills needed to best work and guide students on their postsecondary path. Needs vary by student and support can be provided through nudges, regular check-ins, and one-on-one meetings. First-gen students need help with many of the tasks necessary for successful on-time college enrollment (completing college and financial aid applications, understanding tuition bills, navigating college portals, securing transportation, scheduling classes) and tasks to remain in college (renewing financial aid, overcoming food insecurity, securing tutoring services, finding employment, overcoming homesickness). CPRS priorities include identifying a common set of practitioner competencies needed to effectively guide and support students on their postsecondary path. What advice do you have for students looking for a mentor? My first suggestion for students looking for a mentor would be to do a little research. What kind of mentor are you looking for – a near age mentor, a peer mentor, a school or faculty based mentor, a business or community volunteer, work or faith-based? How would you like to receive mentoring – one on one, face-to-face, in a small group setting, virtually, or via technology (texting, app based, chat room, ect.)? Mentoring outcomes vary by program and mentor. Make sure you understand the objectives for the mentoring program and who will be providing the mentoring. Are they providing general guidance or specialized help? Are they licensed or certified? If so, by whom? How often do they participate in training and professional development? How often will you meet with your mentor? Can you contact your mentor outside of official mentee meetings? Finally, is the mentoring program collecting any evidence that it is working? How are they measuring their success? What have they learned? Has this changed the way they provide mentoring? Youth Build put together a really excellent document Finding Mentors: Finding Success to help students know how and where to find a good mentor. What resources exist for mentors to support students who are applying to college? The National Mentoring Resource Center provides a very comprehensive collection of mentoring resources including mentoring handbooks, curriculum, manuals and other resources practitioners can use to implement and develop mentoring practices. What can schools and communities do to ensure students have access to mentors? What organizational resources exist that can connect students with mentors? There are many organizations that provide mentoring resources. Students can contact their school or university to see what mentoring resources are available on campus. If you don’t know where to start, Mentor provides a search option for mentoring programs around the country.